Today our expert guest is Eileen Kennedy-Moore, PhD, an internationally published author, psychologist, and speaker. Her newest book is Growing Friendships: A Kid’s Guide to Making and Keeping Friends. She is also a professor for The Great Courses, blogger for Psychology Today, an expert contributor to PBS Parents, and the author of two books for parents, Smart Parenting for Smart Kids and The Unwritten Rules of Friendship and What About Me? 12 Ways to Get Your Parents’ Attention Without Hitting Your Sister. 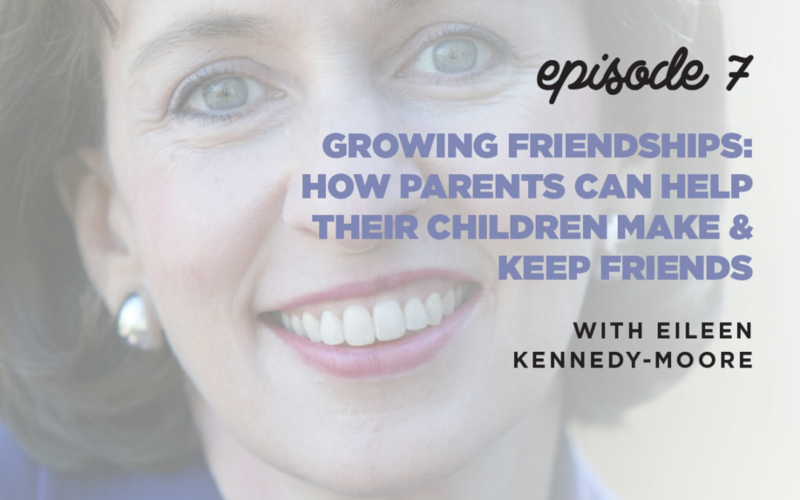 As a clinical psychologist, Eileen has seen how important friendship is for kids. Every parent has seen their child struggle with friend relationships, and these can be very painful for children. The good news is that there’s a lot that parents can do to ease the rough spots and help kids get along with other people. How do Kids Make Friends? Before you can help your children get along with other people, it’s good to understand how children think of other people and make friends at the different stages of their life. Ages 3-6 – The “I want it might way” stage. Kids assume that their friends think the same way that they do. They love the idea of having friends, but they aren’t very good at being friends. Ages 7-12 – The “two-way fairweather / by the rules” stage. Kids are very concerned about fairness, and they think about it in a quid pro quo way. They also tend to be very judgemental about themselves and others, and they can be very jealous. This is also the age where kids tend to make secret clubs. Ages 8-15 – The “caring is sharing” stage. Kids help each other solve problems, confide thoughts and feelings, and are able to compromise. Ages 12+ – The “mature friendship” stage. Kids place a high value on emotional closeness, can accept and appreciate differences between themselves and friends, and start to emphasize trust and support. They also want to stay close over time, even when they’re separated. Does your child have at least one relationship in which they like and are liked by another child? Do they have someone to hang out with at lunch or recess? Everybody has bad days, but there are signs that your child might need help navigating their relationships. It’s important to pay attention to the level of distress and how long it lasts. If your child stays stuck feeling down or thinking nobody likes them, then you might want to consider talking to a psychologist. Non-voluntary isolation is also concerning. If they don’t have someone who likes them back, they are at greater risk for bullying, depression, and negative self thought. There’s also times where you shouldn’t worry. Some kids are just introverts who need quiet alone time to recharge, and they tend to be loners. If they can interact when they want to, it’s okay. Kids have to show an openness to friendship. To do this, they have to greet people that they know or reach out in small ways (e.g. compliments, small kindnesses) to show they like people. Kind children are usually well-liked by their peers. Parents can help children with this by role playing greetings and teaching them to communicate with nonverbal signals. Kids start to believe the “magnet theory” of friendship, where they will attract people to them through being great, but friendships are two-way relationships between equals. Similarity. Kids are more likely to be friends with people are similar to them, particularly in interests and personality. One of the most helpful things parents can do for their kids is arrange one-on-one play dates because that’s what allows friendships to deepen. Shared fun. Kids make friends by doing stuff together. Eileen has a website for children called DrFriendtastic.com that includes friendship questions, quizzes, cute animals, and advice (with a strong dose of silliness). It’s a playful and fun way for children to discover the information they need to learn about getting along. Kindness is the key to friendship. It’s that simple and that complicated. There are a lot of criteria that our kids may or may not meet, but kindness is something that every child (and adult!) can achieve – and they can do it multiple times every day.